We all know that Mt. Everest is the tallest mountain on the planet, standing some 29,029 feet in height. But unless you’ve actually been there, it is difficult to get a true sense of the scale of the peak. But now, thanks to an impressive new image released by GlacierWorks, anyone can witness just how large the mountain is without ever leaving the safety and comfort of their home. The photo, which you can view by clicking here, was shot this past spring by famous documentary filmmaker David Breashears. He was on another mountain known as Pumori, which sits just five miles to the west of Everest, when he snapped the photo using a special camera designed to capture extremely large images. Where as most photos are measured in megapixels, this one is actually more than a gigapixel in size, displaying an unprecedented level of detail and a sense of scale unlike anything you’ve seen before. Don’t believe me? Click on the image yourself and look for the tiny yellow dots in the lower left corner. Those yellow dots are the tents in Everest Base Camp where the climbers make their home for about two months while they are climbing the mountain. A set of controls at the bottom of the screen allows you to zoom in or out of the image to see things close up, while also moving the camera around to take in all of the amazing details. If you look closely, you can even find some of the higher camps on the mountain and spot a trail of mountaineers making their way up the South Col. To truly take in the shot, I highly recommend you put the photo into full screen mode. The image was taken as part of GlacierWork’s efforts to document the impact of global climate change on glaciers in the Himalaya. Everest’s Khumbu Glacier is one of the most famous in the world, and like many others across the region, it is in full retreat. Because these glaciers are a source of fresh water for the people that live in the Himalaya Range, their disappearance could cause massive problems in years to come. Way back at the beginning of April we told you about Nepal’s Save Mt. Everest campaign, a project sponsored by that nation’s tourism board that hoped to clean up the world’s tallest mountain, and the region that surrounds it. Now, two months later, the group has wrapped up their activity, at least for now, and reports that they have removed eight tons of garbage this spring alone. In all, there were 29 Sherpas that were working together on the project, removing all manner of waste products from Everest. Much of the trash that they brought down consisted of pipes, old ropes, plastic bottles, and spent oxygen bottles. Most of the trash is left behind by the climbers and trekkers who visit the region. For instance, the oxygen bottles are used by climbers going to the summit, who require supplemental oxygen to help them complete their climb. Those bottles often discarded and left behind once they are emptied. It is estimated that 20 tons of garbage still remains on the mountain, which leaves an awful lot to remove by the June, 2012 deadline that the Save Everest campaign has set as their goal. But the organization is not alone in their efforts, as the Eco Everest team, consisting of some of the most well known Sherpa guides on Everest, has also been removing trash from the Himalayan peak since 2008. Together, the two teams hope to preserve the mountain, which is considered a sacred place in Nepal. The Nepali government has also done its part to ensure that Everest stays clean for future mountaineers as well. Over the past few years, the country has been doing a better job of enforcing garbage laws that have been in place since 1992, and all climbing teams are now required to carry all of their waste back out of the Khumbu Valley, where it can be recycled or disposed of properly. Failure to do so results in some hefty fines. Having been to Everest, I’m glad to hear that these efforts are yielding positive results. It is a special, beautiful place, and one that definitely deserves to be protected. There is a well known adage amongst mountaineers that says “getting to the summit is only halfway to the finish,” as obviously they have to safely come back down the mountain after they’ve completed their ascent. There are few places where this is more apparent than Mt. Everest, where climbers not only have to make a long, grueling trek to the top, they also have to negotiate a tricky descent as well. Over the weekend, two climbers found a way to avoid that descent however, by paragliding off the summit, bypassing all the challenges of a traditional return to Base Camp. On Saturday, 29-year old Babu Sunuwar and his partner Lakpa Tshering Sherpa, 35, climbed to the summit of Everest. Once there, they assembled their tandem paraglider, and starting it up, both men stepped out into the nothingness that surrounds the highest point on the planet. Rather than plummeting a thousand feet to their deaths however, they took off on what must have been a spectacular flight through one of the most scenic places in the world. 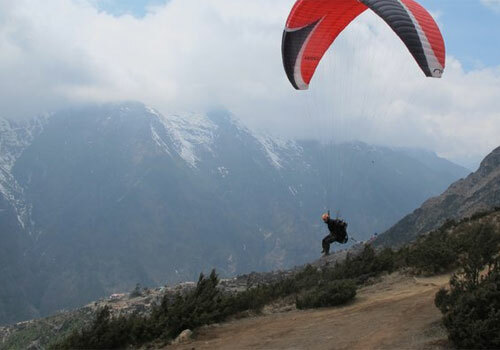 Sailing through the air, Babu and Lakpa passed snow capped mountains on their 42-minute flight, which eventually deposited them at Namche Bazaar, a village in the Khumbu Valley region. Reaching that point would normally take climbers returning from the summit a minimum of three days, but these two avoided a long hike and were soon resting in a comfortable teahouse I’m sure. Their adventure is far from over however. Having reached the highest point on Earth, they are now headed toward sea level by kayak and bike. Their eco-friendly journey will eventually end in Bangladesh in a few weeks time. At the moment, there have been no photos released from this epic flight through the Himalaya. I’m hoping that at some point we might see some video footage though, as I’m sure the view was amazing. I’m also guessing that there were more than few other climbers who were jealous of their method of descent after seeing them take off from the summit as well. Legendary Himalayan mountain guide Apa Sherpa has returned to his home country of Nepal once again this year, where he’ll be attempting his 21st summit of Mt. Everest. If successful, he will extend his existing record as the man to accomplish that feat most often. Apa, who now lives in Utah, left his friends and family last Friday, and set off for the Nepali capital of Kathmandu. That city serves as the gateway to the Himalaya, and most mountaineering expeditions to the region begin and end there. Apa says that he knows that climbing the tallest mountain on the planet is risky, but he feels compelled to go back once again in an effort to help his homeland. The mountain guide’s Apa Sherpa Foundation raises funds to improve educational facilities of children living in the Himalaya. The beginning of April traditionally marks the beginning of the spring climbing season in Nepal, Tibet, and other Himalayan countries. Over the past week, climbers and trekkers have been arriving in Kathmandu and setting out for Everest, Annapurna, and a dozen other high peaks. Climbing these giant mountains is no simple affair, and most will spend six to eight weeks attempting to reach the summit of their choice. For Apa, this is all old hat. He has been making the journey to Everest every year since the late 1980’s, achieving his first successful summit in 1990. For the past three years, he has been a part of the Eco Everest Team, which is made up of a group of very experienced Sherpas who work together to clean up trash from the mountain. The team has been directly responsible for removing tons of discarded gear, empty oxygen bottles, and other waste products from the slopes of Everest. If all goes as planned, Apa should be making his record-breaking 21st summit bid sometime in mid-May. The Nepal Tourism Board has joined forces with the Everest Summiteers Association (ESA) and Eco Himal to launch the “Save Mt. Everest Campaign,” a project which is designed to clean up the world’s tallest mountain, and the Khumbu Valley where it resides, by June of 2012. Everest has always held a certain appeal with climbers and the general public alike, and over the past few decades, more and more adventure travelers have made the journey to visit that natural wonder. As a result, the mountain, and the communities in the region surrounding it, have seen an increase in trash and solid waste to the point that it has become a major problem. Most of the poor villages in Nepal don’t have a safe, ecologically sound method of dealing with those issues. This campaign hopes to change that. Over the course of the next year, organizers of the Save Mt. Everest Campaign hope to remove as much as eight tons of garbage from the mountain itself, as well as along the trekking route between Lukla and Everest Base Camp. They also hope to build 15 waste management plants, and train 100 individuals living in the Khumbu region to staff those facilities. The Nepali Ministry of Environment and Science says that it will also issue new guidelines for climbing and trekking expeditions in the Everest region as well. Those guidelines will be specifically designed to reduce the amount of waste that is generated by the visitors to Everest. Having visited the Khumbu just last year, and made the trek to Everest Base Camp myself, I can tell you that garbage and other waste can be a serious problem there. I was surprised to see that they still sold bottled water, as I think it would be more ecologically friendly to require visitors to bring their own reusable bottles or hydration packs. This new program hopes to make those kinds of changes and have a positive impact on an environment that is amongst the most spectacularly beautiful on the planet. Lets hope they’re successful.